Steam's new smartphone app is now available for all users, letting them buy games from their mobile devices whenever, wherever. Well, that didn't take long. Mere days after Valve released its Steam Mobile App for closed beta testing, Valve has now made the program available to everyone who owns an iOS or Android device. 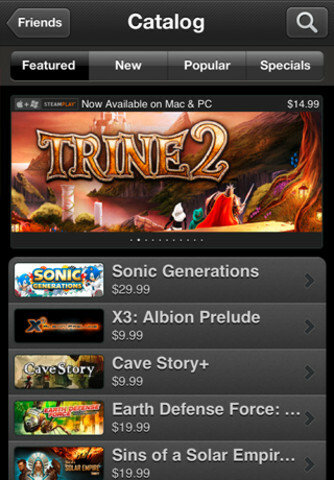 The Steam app allows users to browse its game catalog and make purchases from wherever they may be, whether it's the office, a restaurant, or the beach. The app also provides news about upcoming events and games, lets users chat with friends, and ignores the sound of your bank account crying out in fear while looking over one of their annual holiday sales. The app is available for download from the App Store and the Android Marketplace, and all you'll need is your Steam login to access to full gamut of features.